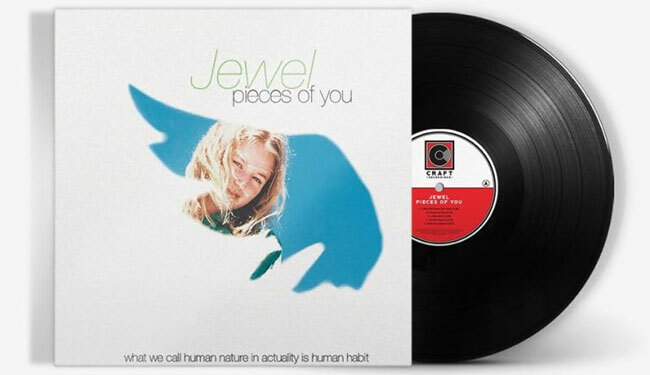 Craft Recordings is reissuing Jewel’s debut album, Pieces of You, on 2 LP vinyl on February 15th. Like the original, the long out-of-print 2 LP vinyl features five bonus tracks that originally appeared as B-sides on the album’s single releases, with lacquers cut by Chris Bellman at Bernie Grundman Mastering and pressed at Memphis Record Pressing. Barnes & Noble also will be selling an exclusive blue vinyl version. Acclaimed American singer-songwriter-poet Jewel has enjoyed career longevity rare among her generation of artists. Since achieving international stardom over 20 years ago, Jewel has emerged as a charismatic live performer and a respected songwriter with 12 studio albums, four GRAMMY nominations, and over 30 million albums sold worldwide. Signed before she was 19, Jewel credits her great mentors Bob Dylan, and Neil Young who took the time to encourage her as a young artist, advising her to take risks and make music she is authentically interested in. Pieces of You was released in 1995, recorded in a studio on Neil Young’s ranch, and included Young’s backing band, The Stray Gators. The album stayed on the Billboard 200 chart for two years (peaking at No. 4) and spawned Top 10 hits including the certified platinum single “You Were Meant for Me,” “Who Will Save Your Soul,” and “Foolish Games.” Described by Rolling Stone as “a record that carved out a perfectly confessional, coffeehouse niche between the decline of grunge and the rise of slinky pop princess.” The album also reached mainstream success, going on to sell over 12 million copies and becoming certified 12x platinum ─ making it one of the best-selling debut albums of all time. Jewel’s versatile music career has spanned seven studio albums ranging in genre from pop, folk and country. In addition to singing and songwriting, Jewel is also a successful actress and philanthropist. In 1997, Jewel founded her water charity and brought clean water to 15 countries. Recently, she partnered with the Inspiring Children Foundation to start the Never Broken Foundation and online program. This program makes mindfulness and emotional intelligence tools available to the masses at no cost. A lifelong passion of growth and health is helping Jewel become the spokesperson of modern-day wellness and mindfulness. Jewel’s “Whole Human” philosophy is designed to help people gain tone and strength in all areas of their life, most importantly as friends, associates, and contributes to society.